Under the Miner's Welfare Scheme and in order to provide recreational facilities for the miners and their families living in Heddon, a field was acquired near the post office and the common at the sale of Sir James Knott's property by auction on 11th March 1924 for the sum of £220.00. The transaction was signed and sealed on 2 May 1924 on behalf of the Welfare Association by Ernest William Stephenson, William Keir, John Henry Brown and Jonathan Rowland. Swings and a roundabout were erected for the children and a hall built on the south-west corner; the hall, a prefabricated building on a brick base was used for dances, concerts, lectures etc. With the closing down of of Heddon Pit, and no income forthcoming from the 1d per ton levy and miners' contributions, the welfare at Heddon became a financial liability. 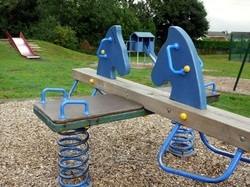 The Welfare Association agreed to the transfer of the field to the Parish Council for its maintenance as a children's playground; the hall was dismantled and removed. The transfer to the Parish Council was made on 3 June 1937. The lower half of the field was levelled with some of the surplus soil from the new village housing estate and resown with grass, thus making a much better playing surface for games. In recent years a Multi Use Games Area (MUGA), securely fenced and with all-weather surface marked out for a variety of sports, has been installed at the south end.